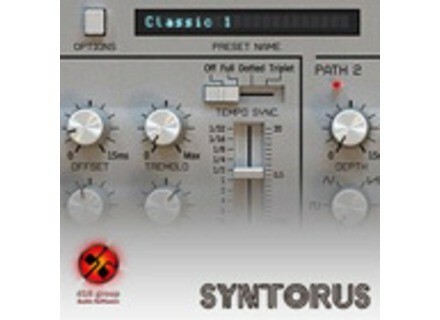 Syntorus, Software Chorus from D16 Group. songboy's review"Decent for a chorus plugin"
I have had no compatibility issues running this on both a Macbook Pro and and Mac Pro both running Snow Leopard and using Logic 9. I haven't referenced the manual as I am familiar with all the parameters on the plugin. It does have a fair amount of knobs and buttons but they should be recognizable to anyone who has used a synthesizer or robust chorus effect. All of the functions are easily accessible, although the plugin itself is sort of a pain to read being that it is fairly small on the screen. This is a common complaint of mine for a lot of software. So far no crashes or hiccups. I have had good experiences in the past with d16 when it comes to stability and this plugin in no exception. In comparison to other software chorus' this plugin does stand out. The sound is a little better than most of the chorus' I have used but what really stands out is the ability to select different waveforms when dialing in your sound. This is a cool add on and can yield some very interesting sounds. The square waveform seems to me to add the most depth and warmth. I have been using this plugin for a few months now but it is not the first chorus effect I reach for. What I like about the plugin most is the options you get when crafting your sound. I have never used a chorus plugin with so many parameters and you can really dial in some interesting effects. What I don't like is the overall quality of the Chorus. In fairness, all software chorus' I have used have always seemed a little lackluster. I am biased I admit because I invested in a "Diamond Halo Chorus" a few years ago and even though it technically is a guitar pedal, it has a stereo signal path. It also has the best chorus I have ever heard personally and it sounds great on everything I have ever used it on. Because of that, I only use software plugins for convenience or if my Halo is not on me during mixing. The value of the price is not bad, but I do recommend a quality hardware chorus over any plugin. Chorus is an effect that demands warmth and depth and even though software plugins can sound quite good, they just don't compare to the real deal. I will say that this chorus destroys both Logic and Ableton's built in one. If you need the convenience of software, then this chorus is a fair deal.